As you all know I am a huge fan of del.icio.us.. I have tried other social bookmarking sites such as Ma.gnolia and diigo, but I have pretty much stuck with del.icio.us. That's where my friends hang. Where I like del.icio.us, I would like it to better facilitate communication around bookmarks with my network. (And I'm pretty sure this contradicts something I might have said previously.) I thought about this today when I had a hightouch moment. I realized how much I like the "links for you" feature, and that there is no way for me to directly thank people who take the time to share. There is also no way to have a conversation around bookmarks which would be nice. 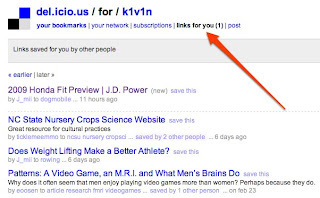 The "links for you" feature is rarely used. Yes, I would see the items these people have bookmarked in the "your network" feed, but there is something special about someone clicking on your name and sharing something directly. It has more meaning when someone reads something, and makes a conscious decision to highlight it just for you. So, to the very few of you who share things directly, thank you! I plan to use this feature much more myself in the future.